Two powerful Swedish interest groups have turned to the European Commission to try and enforce a complete ban on alcohol advertising on television. Sweden already has a total ban of alcohol advertising on TV, but this regulation is circumvented by Swedish language channels broadcasting from abroad. Both the Swedish Consumer Agency (Konsumentverket) and the Swedish Civil Contingencies Agency (Myndigheten) believe that broadcasters Viasat and SBS are circumventing the ban as they are licensed by Ofcom in the UK. The case against SBS and Viasat started in 2011, when temperance society IOGT-NTO filed a complaint against several TV-channels to the Swedish Broadcasting Authority and the Swedish Consumer Agency regarding alcohol marketing on TV, stating that these channels breached the alcohol advertising ban. Viasat and SBS are considered to be established in the United Kingdom but broadcast several Swedish TV-channels that are wholly directed to a Swedish audience. In the end of December 2011, the Swedish Broadcasting Authority (SBA) announced that they would go ahead with IOGT-NTOs complaint, by referring to the EU’s Audiovisual Media Services Directive, and further look into the issue of alcohol advertising on TV broadcasted from abroad. Since then it has been confirmed by both SBA and its British counterpart Ofcom that the TV-channels are under British jurisdiction but that they wholly target the Swedish audience. In the end of 2012 SBA formally requested Ofcom for an enhanced cooperation procedure under article 4(2) in the AVMS-directive. As a result Ofcom had to carry out the request and ask the relevant broadcasters to comply with the Swedish law and the ban on alcohol advertising and sponsorship in television broadcasts. At the end of January 2013 the broadcasters replied to Ofcom that they don’t think it’s appropriate to comply with the request. 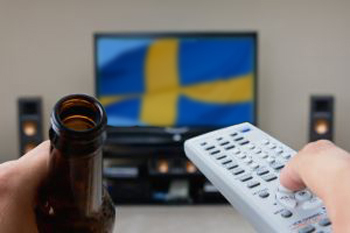 Last week, the Swedish Broadcasting Authority announced that they are together with the Swedish Consumer Agency are contacting the European Commission in order to get their approval to prohibit alcohol advertising on TV transmitted from other countries. Once the EU-Commission has gotten the request they have up to 3 months to give their answer. The reaction of the European Commission will prove to be a landmark decision as it is the first time in history the commission will speak out on the subject of transnational broadcasts and how this affects sovereign laws.